Now that 2012 is upon us, it seems the Mayan culture has become more intriguing than ever. Mexico’s Yucatán Peninsula is known as the “Land of the Maya” and it stands as a tribute to one of the most prolific and fascinating civilizations the world has ever known. The ruins of complex ancient cities are scattered throughout dense jungles and lush rolling hillsides. But it’s here, in the state that shares its name with the region, the magic and enchantment of the Mayan world are at their most brilliant. If you have a week (or more), a trip to Yucatán to explore these treasures will be an adventure you’ll never forget. Having seen a number of archeological sites throughout Mexico, I can honestly say that Uxmal (oosh-mahl) is my personal favorite. There is a certain energy here that I’ve never felt at the sites that seem to get a bit more tourist traffic. There never seems to be much of a crowd here, which makes it all the more alluring. 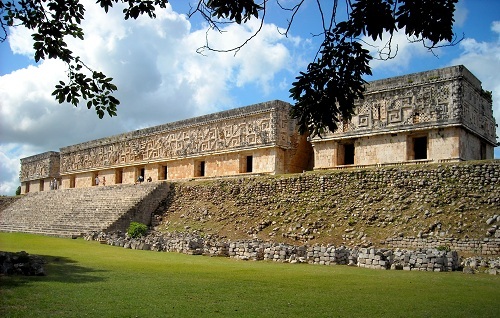 Uxmal is located 58 miles south of Mérida, along what is called La Ruta Puuc. 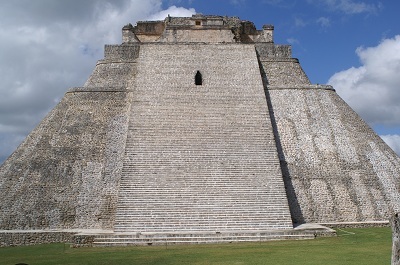 “Puuc” means “hills” in Maya, so a fair translation would be “the hilly route.” The archeological sites found along this route include Uxmal, Kabáh, Labná, and Sayil. Puuc also defines the architectural style of these particular sites whose structures are characterized by elaborate and ornate façades quarried from stone in the region. Puuc architecture is also identified by the lower blocks of the buildings being plain while the upper levels are highly decorated and often have representations of the Mayan rain god, Chaac. 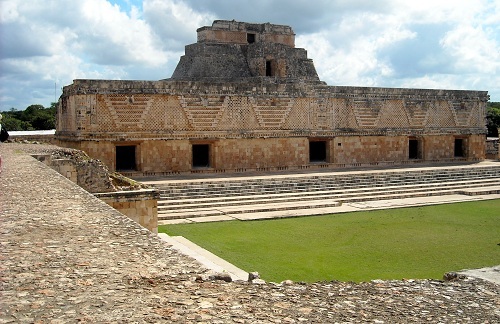 Architecturally speaking, Uxmal is said to be one of the most significant sites in the ancient world. Founded around 700 A.D., Uxmal (meaning “three times built”) was created in various stages and many of the buildings are stacked in layers of stone. The centerpiece is the extraordinary 115-foot tall “Pyramid of the Magician,” which is actually five temples layered on top of one another. This is absolutely one of the most breathtaking sites in all of Mexico. It’s almost surreal to stand in front of it and try to conceive of what it might have taken to construct. On the day we were there, a breeze rustled the trees and perfect, puffy clouds made every photograph look like a postcard. Once you move past the awe of the pyramid, you’ll make your way to the “Nun’s Quadrangle.” This is a huge open plaza flanked by four (almost perfectly preserved) massive buildings with 74 rooms and carved stone doorways. Given its name by Spanish explorers who thought it resembled a convent, the quadrangle is thought to have been a palace for one of Uxmal’s prominent kings. The “Governor’s Palace” is another of this site’s many treasures and almost rivals the main pyramid on the “awe” scale. Some archeologists consider this structure the “most spectacular single building in all pre-Columbian America.” This enormous building (320 feet long) is situated on five terraced acres and is covered with some 20,000 intricate stone carvings. If you stand far enough way, you can see stone masks of the rain god, Chaac (103 of them to be exact) woven into the design. At the front of the building, a jaguar throne made of stone implies this may have been the home to chiefs or kings. Just behind the palace, it’s worth the 260 foot climb to the top of the “Great Pyramid” to take a look at the Temple of the Macaws. 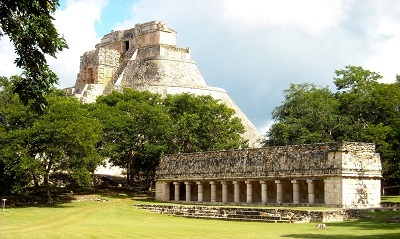 Not to mention incredible views of all Uxmal. After leaving Uxmal, we had a chance to visit the Mayan village of Santa Elena. Seemingly lost in time, this village is still home to many Mayan families who practice the traditions of their culture. We went to the humble home of Azaria and Hernán. I am sure they have a last name, but their warm, welcoming smiles were all we really needed to know. She spoke in Mayan (which to me resembled something similar to Navajo or Apache) as they showed us around their single room palapa home. Hammocks are strung across room for sleeping, and an altar sits in front of one of the walls. 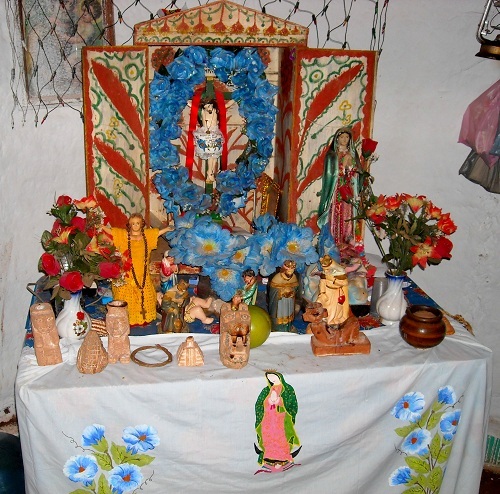 Their altar is a fascinating mixture of Mayan figurines and Catholic icons, something that is very common throughout the region. 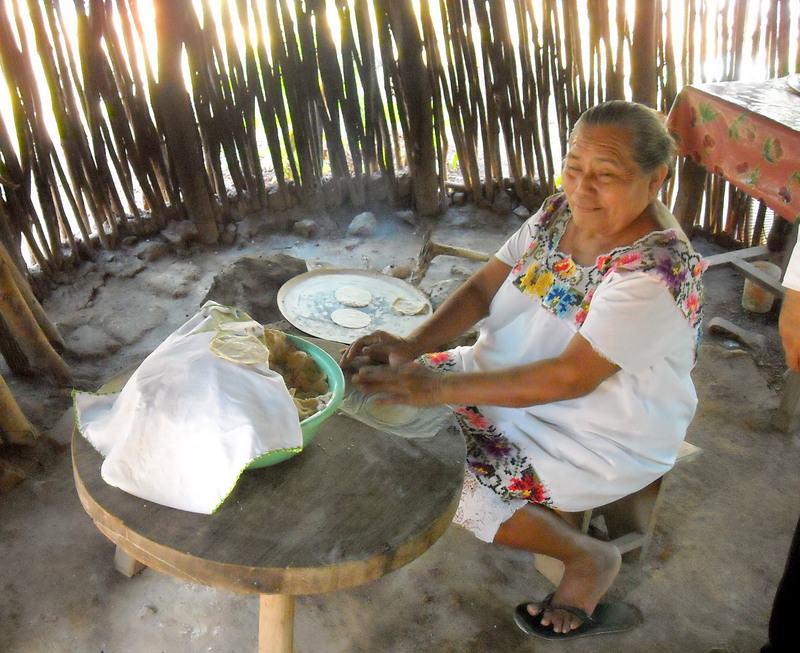 The kitchen is in a detached palapa located a few steps from the “main house,” and Azaria is happy to cook us up some incredible fresh corn tortillas. Hernán shows us the rest of the homestead, careful to explain all the plants and what they are used for. 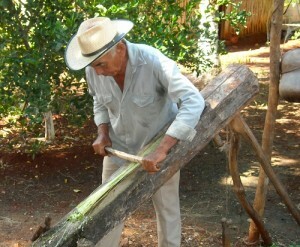 They have some henequén plants on the property and he makes fast work of the fibers to show us how he makes rope by hand. It was a humbling and beautiful experience to be at their home. Our last stop of the day was to meet with Mr. Don Gaspar Xiu –a local celebrity, author, professor and former President of the Supreme Maya Council. He is the descendent of a dynasty of Mayan kings and is a notable authority the culture. 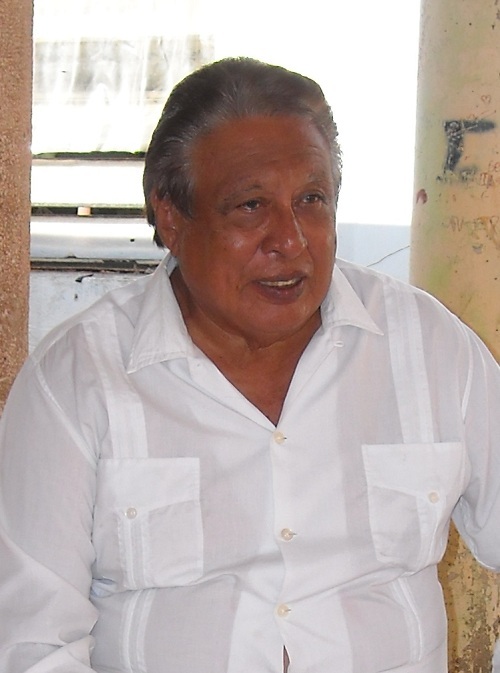 Mr. Xiu’s lineage links him to the last Xiu king that governed Uxmal and he has spoken about Mayas both in and outside of Mexico. Mr. Xiu has been a huge force behind the resurgence of Mayan culture in his native state of Yucatán and has become a well known speaker and presenter as well. I am very interested in all the press and speculation about the meaning of 2012…and Mr. Xiu was more than happy to explain and to assure me the world is not ending. The Maya were very complex people, as is their calendar, which consists of symbolic and symmetrically grouped time-periods. December 21, 2012 signifies the end long count calendar and a unit of time known as a “katún.” So in actuality, the end of 2012 is a new beginning… the beginning of a new katún. The Mayan katún predictions are cyclic and each new katún brings a new idea and a new energy for the world. As this katún begins, the prediction is for a new awareness and a brand new path for humanity. We could all benefit from this Mayan wisdom. If you have a chance to visit the Yucatán during this magical year, indulge yourself in the pyramids, prophecies and all the energy that is a part of this extraordinary culture. Could The Pyramid Of The Sun Pancake? this was so interesting to read !! wonderful report. Great article, Lisa. Your subject is one that is very near and dear to me, the Maya, and their prophecies. I ‘m partial to Uxmal, too. It’s a fantastic site.